Is the Yola site down right now 7/8/11? I dont know if the site is down right now but for 2 days now when I click on "my yola" all it says is "loading sites" it never pulls up my site for me to get into and work on... Can someone tell me what is happening? I see that your site is not published to your domain name, would you like me to do this for you? I can't get into it to publish it - that's the problem. I've just registered it and I can't access it at all. I sign in and then it says loading and just continues 'loading' with nothing happening. Yes, go ahead - but I'd like to be able to add pix etc and don't know how unless I can access the web page. Oh I'm sorry, I thought you meant you could not access your published site, but I see now you were referring to your Sitebuilder. If you are unable to load your My Yola page, unfortunately this is a bug that we're working on fixing. We're really sorry for the inconvenience and will let you know when we have more information or a fix in place. What you are seeing with your sites not loading on the My Yola page is a bug we are currently working on fixing. Can you try another browser, such as Chrome or Firefox, and see if that helps the problem. I'm sorry for this inconvenience and we'll have this fixed up as quickly as we can. Have tried Chrome and firefox, no luck. nevermind, chrome worked PDQ. yola is awesome! We're still working on this, is anyone on this thread able to post a screen shot here of what you see when you are trying to login. It would be helpful to us if we could see the message you are receiving. This is all I get - the little busy arrows just keep going round with no actual loading ever happening. It's exactly the same in Firefox. No, no help to clear the cache. Here's what I get when I try to load my page. 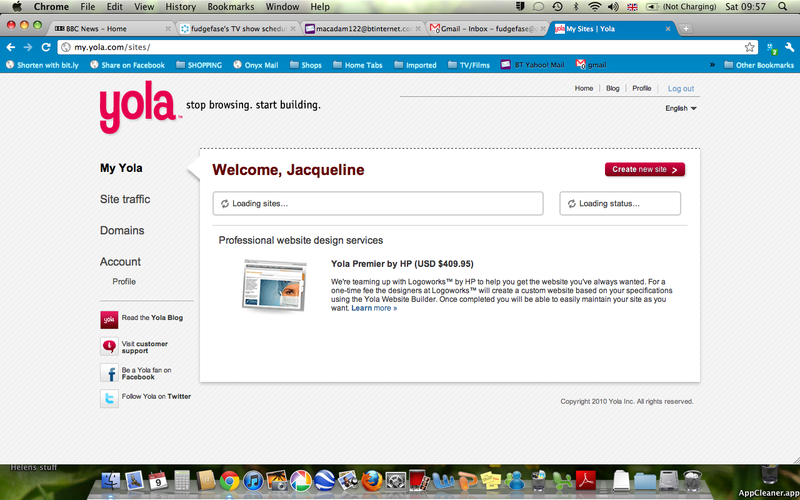 I'd really like to get the site going, but feel like maybe Yola is not going to be the one for me. Thanks for providing those screenshots. I understand this is frustrating, and you can rest assured that it's as frustrating for us and we are working furiously to find out what is causing this problem and how we can fix it. 1. Which country you are in. 2. Whether you are on a PC or a Mac. 3. Whether you have any antivirus software installed. We have also had some feedback from other users, who have been experiencing problems in IE and Firefox, that they have been able to access their My Yola and Sitebuilder using Safari. If you are able to try this and let us know whether it helps, it would be really helpful. Thanks again for all your feedback and patience. We really do appreciate it. In Scotland on a mac. Sophos anti virus. LOL! Yes, it did! Thanks for that information - I have passed it on to our engineers and we'll let you know as soon as we have more information. Yes, I can access through Safari but would still like the bugs fixed. Thanks. I wanted to update you on our progress with this bug. The problem we are having is that we are having trouble replicating what you all are seeing. What this means is that we need to be able to see and experience the bug ourselves to troubleshoot the underlying cause. What we are doing right now is trying to gather as much information as possible from people to see what the pattern might be. Such as a certain browser, operating system, geographic location etc. Some people have said that switching their browser to Safari solved the problem. We do understand that switching browsers is not the best solution, but until we have this fixed up it could provide some relief. Here is a link to do this if you do not currently have Safari: Download Safari. 1. 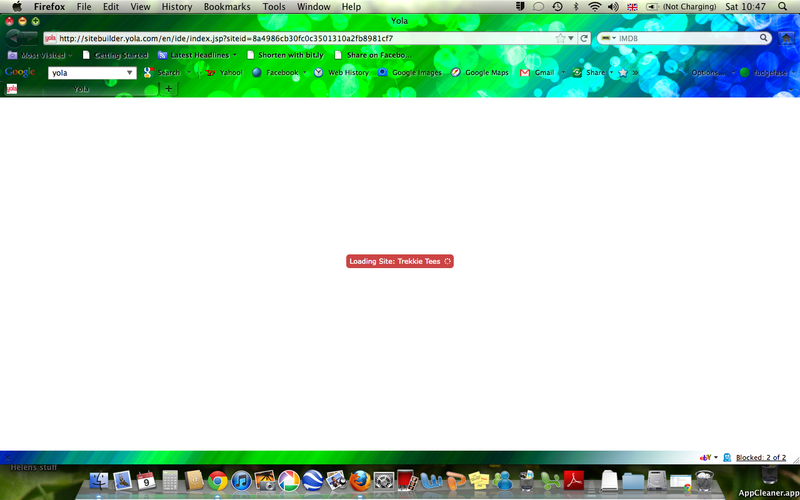 A screen shot of what your page looks like when it does not load. 2. The browser you are using, does switching to Safari work? 4. Are you working on a PC or Mac? Thanks much for working with us on this. Safari allows it to load. Don't understand why I can't get it on any of the others. Does not load on Firefox or Chrome, have put screenshots up already (can log in but it says logged in, redirecting, and then it takes me to the screen shots above). Geographic location is UK and I use a mac. Thanks fudgefase. Any information we receive here we will be using for troubleshooting. We totally understand and agree that this should work in all supported browsers, that is what we are working towards. I do appreciate your patience while we work to remedy this. Me again! Is there anyone who is being affected by this that can give it another try not from Safari, but from whatever browser you were in that produced the problem of not being able to get to your sites. We have been doing some troubleshooting and would like to see if an implementation we made makes any difference for you. I am happy to report that the bug you were experiencing has been fixed! If you do still see a problem, clearing your browser's cache will most likely take care of this: clear your cache. Thank you very much for your patience while we worked on that and please let us know if you have any further troubles. hallelujah - it works on Chrome now! Wheehee!! Thanks you all so much.